Updated November 28, 2010 – The Allen Parkway Village (APV) public housing complex sits inside the Freedman’s Town historic district here in the Fourth Ward in Houston, Texas. It was the site of a major community organizing struggle that the tenants engaged in from 1982 until 1996. We have boxes of documents related to this struggle that we will scan and post as time permits. For now we’ve posted a small sample. Next update will tie what happened at APV back in the 1980s to the mid 1990s to the crooked business that is currently going on at the Gregory Library. Stay tuned! 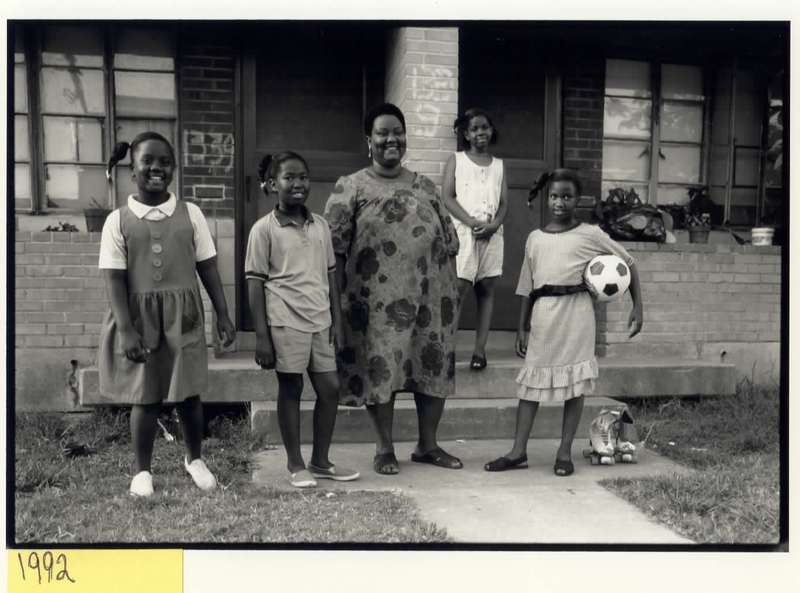 Wessie Syrus and family in front of their unit in Allen Parkway Village. 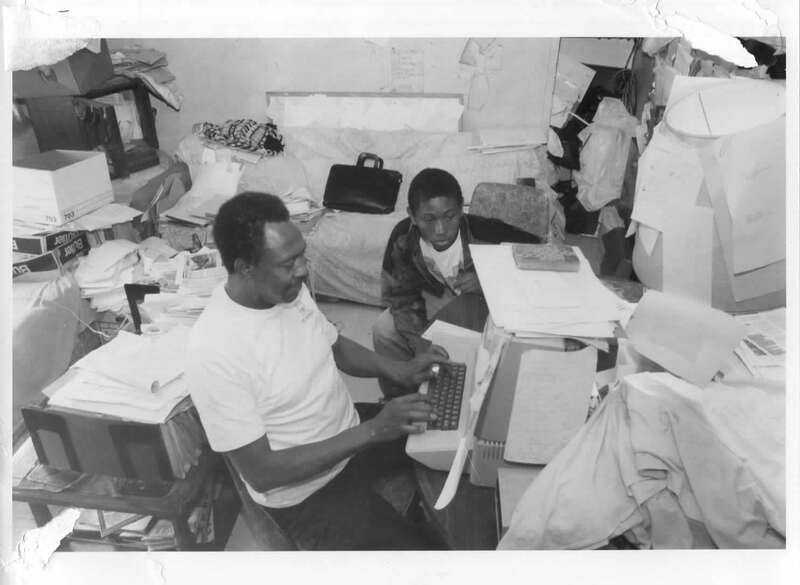 Residents Council President Lenwood Johnson working in his APV unit in 1993. The APV “Stakes in the Ground” agreement 3.22.1996 is what then Housing and Urban Development (“HUD”) Secretary Henry Cisneros proposed to settle the standoff between residents and the City of Houston at APV. Lenwood Johnson, the President of the Residents Council and Cisneros signed it on March 22, 1996. Note U.S. Representative Sheila Jackson-Lee tried to horn in and take some credit even though all she did was attempt to stab the residents in the back at every turn. There was no signature block for her because she was not at the negotiating table. $36 Million HUD grant to APV In January 1995, HUD Secretary Henry Cisneros signed over a thirty-six million dollar plus grant to the Houston Housing Authority to revitalize Allen Parkway Village. This document shows a few specifics. Note that it was the APV residents, including Wessie Cyrus, (now known as Njeri Shakur), Mary Pruitt and Lenwood Johnson that led the successful fight to save Allen Parkway. Exiled APV residents hold press conference at TSU 11.18.10 from Tim O’Brien on Vimeo. Njeri Shakur part 1 10.2.10 from Tim O’Brien on Vimeo. Njeri Shakur part two 10.2.10 from Tim O’Brien on Vimeo. Njeri Shakur part three 10.2.10 from Tim O’Brien on Vimeo. Njeri Shakur part four 10.2.10 from Tim O’Brien on Vimeo. In 1993, the Houston Housing Concern rallied over 100 organizations to endorse preservation of APV and the Fourth Ward. Here’s that list of endorsers for the preservation of APV and 4th Ward. 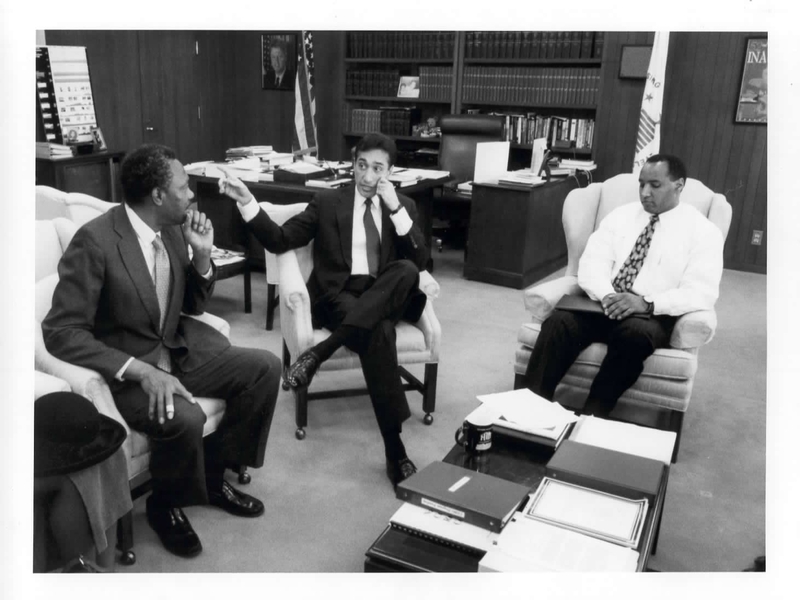 Lenwood Johnson and HUD Secretary Henry Cisneros (and aide) in his office in Washington, D.C.
All of the photos and articles are so valuable, in other words they are priceless. Thanks for putting all of the history from Freedman’s Town together and making it available to the public. I pray that they read and appreciate your work, especially the new residents of FT.